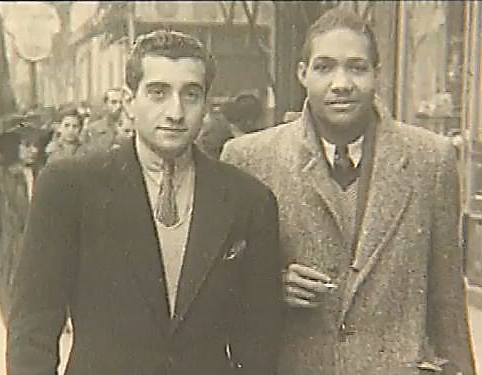 Expatriate, impersonator, and concentration camp survivor Jean Marcel Nicholas was born October 5, 1918 in Port-au-Prince, Haiti, one of the three children of Hilderic Nicholas, a secretary of the British Embassy in that city, and Lucie Dalicy Nicholas. His family was financially secure and able to send him to France to be educated at the Lycée Aristide Briand (Aristide Briand School) at Saint-Nazaire and the College de Garcon at Grasse. In 1937, he left for Martinique and enlisted in the French Navy. After discharge from the Navy with a head injury in 1939 he returned to France and briefly attended medical school at the University of Paris. When World War II began on September 1, 1939, 20-year-old Nicholas, along with many Frenchmen, fled to Marseilles but later returned to German-occupied Paris. Despite that occupation Nicholas freely circulated among artists and writers and maintained his friendship with Dr. Hans Pape, his medical school classmate, and Vivian Romance, a film star and former Miss Paris of 1930. But Nicholas represented himself differently to those he believed he must deceive. Highly fluent in French, he also knew German and spoke English with an American accent learned from American Marines stationed in Haiti. His command of English was a necessary subterfuge that enhanced his posing as a Boston, Massachusetts-born U.S. Army Air Force fighter pilot, supported with fake identification papers, who had parachuted into France on a secret mission. Nicholas also pretended to be medical doctor, complete with white smock and Heidelberg University diploma in gynecology hung on an office wall. But when a French woman reported him to the German Gestapo as an American spy, Nicolas was interrogated and arrested in 1943, hauled off to a Dora slave labor camp in central Germany, one of the subcamps of the Buchenwald concentration camp complex, and designated American POW No. 44451. He was later transferred to the massive camp in the Hartz Mountains where the Nazi’s V-1 and V-2 guided missiles were assembled. Again, marshalling his wits and taking advantage of his fluency in German and prior medical training, he persuaded his captors to allow him to treat fellow inmates in a decrepit shack that served as a hospital, thereby avoiding the cruel fate that tens of thousands suffered and died there. Called “Dr. Johnny Nicholas,” “Maj. John Nicholas,” and “St. Nicholas the American,” he became famous for saving the lives of countless men and encouraging them to keep faith that the Allies would eventually liberate them and return them home to their families. Injured in the closing days of the war in Europe, Nicholas escaped from the Hartz Mountain camp and was picked up by American soldiers from the 87th Cavalry Reconnaissance Squadron and evacuated to a hospital in Paris where he died of tuberculosis on September 4, 1945. Nicholas, 26 at the time of his death, was buried in the Cimetière parisien de Pantin (Parisian Cemetery of Pantin) in northeast Paris. Hugh Wray McCann and David C. Smith, The Sear for Johnny Nicholas: The Secret of Nazi Prisoner No. 44451 (CreateSpace, 2011); Hugh McCann, “Macho ‘American’ Posed as Doctor in Nazi Prison Camps,” in Los Angeles Times (March 29, 1984); “Blacks in Nazi Germany” at https://www.lipstickalley.com/threads/blacks-in-nazi-germany.1177802/.